The Needle Arts Guild of Toledo celebrated Spring's Beauty on Saturday, July 27, 2013 at Nazareth Hall in Grand Rapids, Ohio. Teachers Jane Ellen Balzuweit and Marylyn Doyle designed a beautiful layered piece featuring irises. 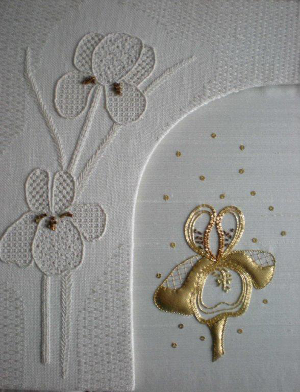 The top layer has a pulled work iris pattern with a background of darning stitches, while the under layer includes a goldwork iris on silk. The Needle's Nest Chapter hosted the EGA Illinois State Day Workshop on Saturday, August 17, 2013 at Prince of Peace Lutheran Church in Schaumburg, IL. 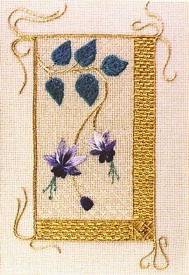 Instructor Kay Stanis' design, Oveture II, provided a basic introduction to Silk and Metal embroidery. Visit Kay Stanis' website for more information about her and her work.